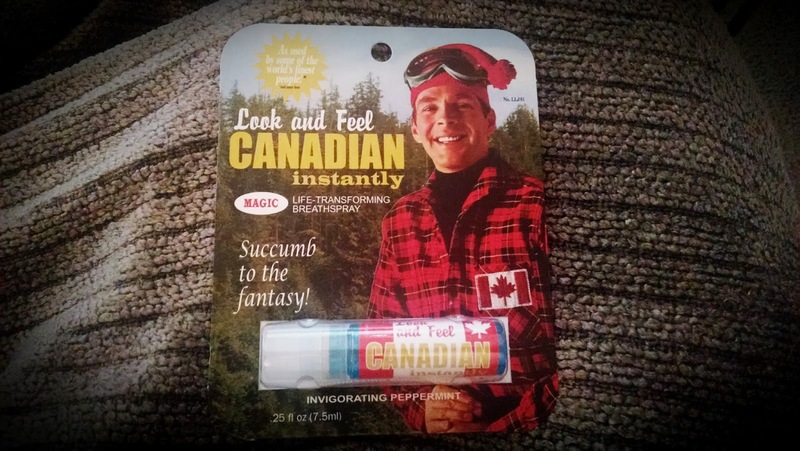 Look and Feel Canadian Instantly with Life-Transforming Breathspray! "You may have read about Canadians in books or watched documentaries about their country on TV. But you probably never imagined that you could be part of this alternative lifestyle ... for less than the cost of a glass of beer." "Feel Canadian and instantly experience an enhanced appreciation of fresh water lakes, rippling streams, moose, squirrels, bears, maple syrup and loons. Discover simple pleasures like trout fishing, snowshoeing, wiener roasts and campfire sing-a-longs. And, best of all, look and feel Canadian!" This goofy I-Wanna-Be-Canadian product is one of many offered by BlueQ, a company out of Pittsfield, Massachusetts. So how does the peppermint flavor breath spray taste? Not bad. Sort of like misty Altoids. But do I look and feel Canadian instantly? Not really, but I am flying to Nanaimo and Victoria, BC next week via Kenmore Air. Pretty cool, eh?